Why OMSB planted? Used saltbush to help lift farm production and to fix a degraded wind blow out area which is similar to a clay pan. What grazing and pasture benefits have been observed? The ground is softer and healthier. We have our old native grass species coming back into the saltbush paddocks. 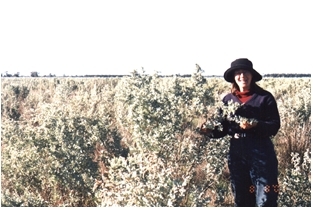 I aim to have enough bush to be able to graze all my saltbush for approximately 1 month per year which then gives a valuable rest to other paddocks. What financial benefits have been observed? Even with my small area I can see it has helped to increase the carrying capacity and makes general stock management easier. Biggest OMSB impact? It has enabled the other paddocks to have rest at important times and I have feed now when it is dry. It also save me time not having to handfeed. Any problems with OMSB? Establishment only. You have to have support from people that know what they are doing. Would you like to increase your area sown to OMSB? Yes  I have been trying. Last years block that I was trying to plant was washed out.